I needed new sandals before we go to Kuwait. I’ve been trying to buy up a few little things at a time, but today was the day to bite the proverbial bullet and purchase footwear that would carry me comfortably through the desert–while keeping my feet looking cute. I generally buy cheapish, easy to wash clothes and good but highly-affordable shoes. I really haven’t had the money to splurge on footwear for the last decade and I’m really not in the habit of spending much on myself. 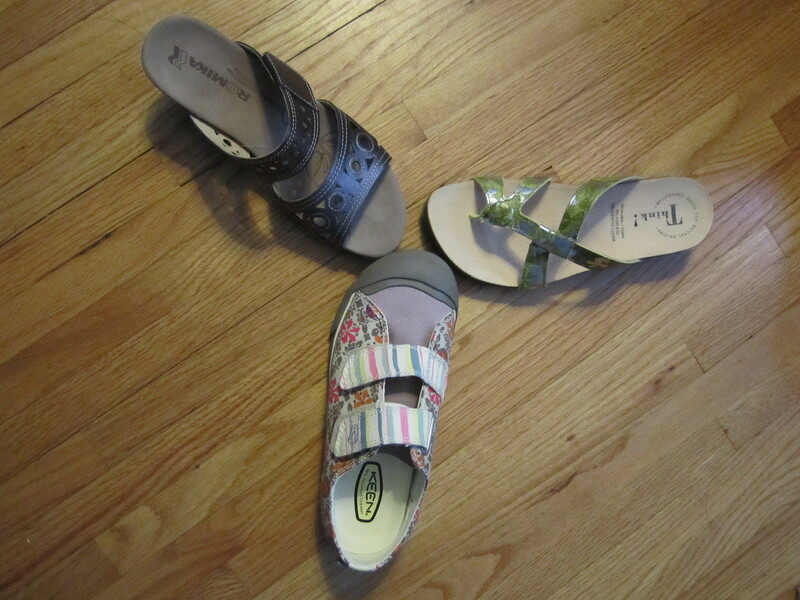 The Electrician’s mom warned us to bring comfortable shoes that will be okay in the heat, namely quality sandals, and I don’t want to be stuck thousands of miles from home with blisters on my feet, unable to read the labels on bandaid boxes. I have one pair of flip flops I bought in Hawaii a year and a half ago, and while they’re pretty great to bum around in, I don’t trust them for the kind of excursions we’ll be making in Kuwait. At the advice of a colleague, I decided to go to the spectacular high-end shoe store on my side of the city. None of my girlfriends were available for a shopping trip, so I asked The Electrician to come along. The benefit of taking your sweetie along on a shopping trip is that he almost always volunteers to drive and to carry the bags. It feels a little like stepping into the life of a lady of luxury for a few hours, being shuttled around and handing off your parcels to someone burly. Unfortunately, the man in one’s life lacks the same critical eye of a trusted female friend, and (wisely) says everything looks good. He is not very helpful at helping a gal narrow down her list of potential purchases. Separated from their partners, the left shoes tried to maintain a conversation and pretended they didn't feel awkward. 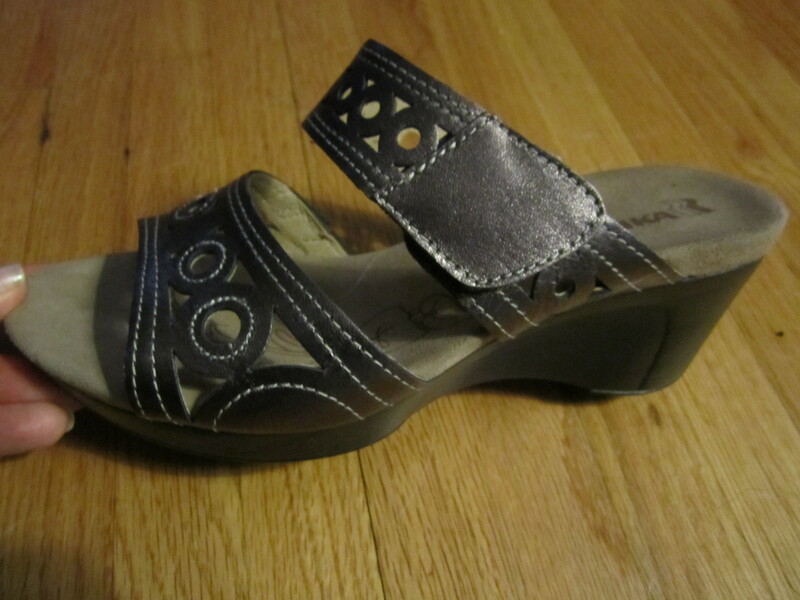 I started out by locating a pair of wedge heel sandals in a neutral colour that didn’t look like they were fit for the geriatric ward. It took a little doing, but I found them, hiding behind a couple pairs I’m sure my grandma owns. Comfy sandals are a favourite of the older generations, especially when paired with compression stockings and sun visors. The tan lines are going to be brutal. At least they're comfortable and appropriate for work. 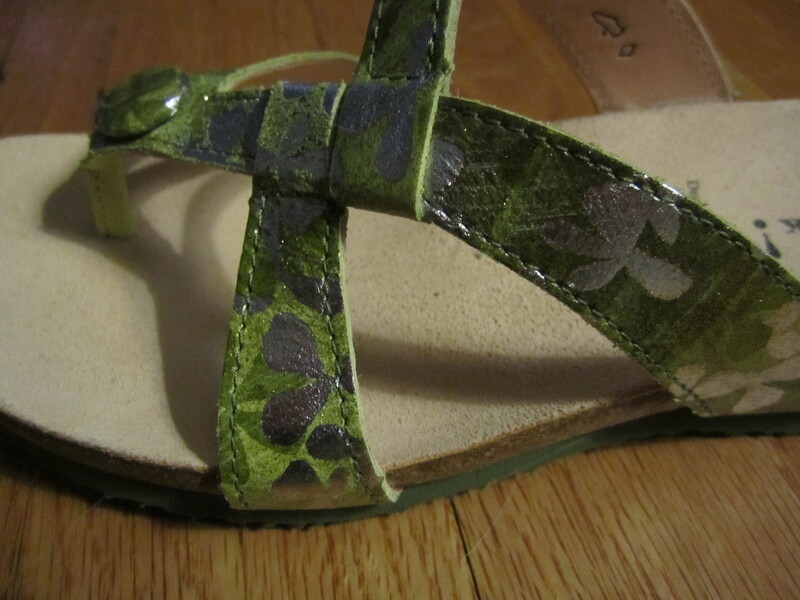 On my trip back to the bench with the first pair, I saw these green beauties on the half-price rack. They were in my favourite colour and in my size (and the only pair left in the store) and I picked them up too. Clearly, it was a matter of pre-destination. Can you see the shimmery green flowers? They feel like heaven on my feet, too. Then, while I was sitting on the bench across from the kids’ shoes, I spotted these little beauties. I wear girls’ shoes at least half the time, so I asked the salesguy if they had them in a four. They fit beautifully with a surprising amount of extra room, so they got to come home with me too. I may or may not have skipped across the store in these, giggling like a maniac. They screamed my name. I had no choice. It's very embarrassing to be hollered at in a fancy shoe store. All told, I spent my clothing budget for two months at the spectacular shoe store today. Oops. I didn’t touch my food budget, and I didn’t dip into the money reserved for my mortgage or my bills, nor did I buy my shoes on credit. I wasn’t exactly irresponsible, but I still felt a little naughty walking out of the store with The Electrician carrying three shoeboxes behind me. It was a rather rebellious day. They should put a warning sign on the door of that shoe shop. A girl could dig herself up all kinds of trouble in there. I love the green ones. I can’t believe you can wear a size 4! I love them too! 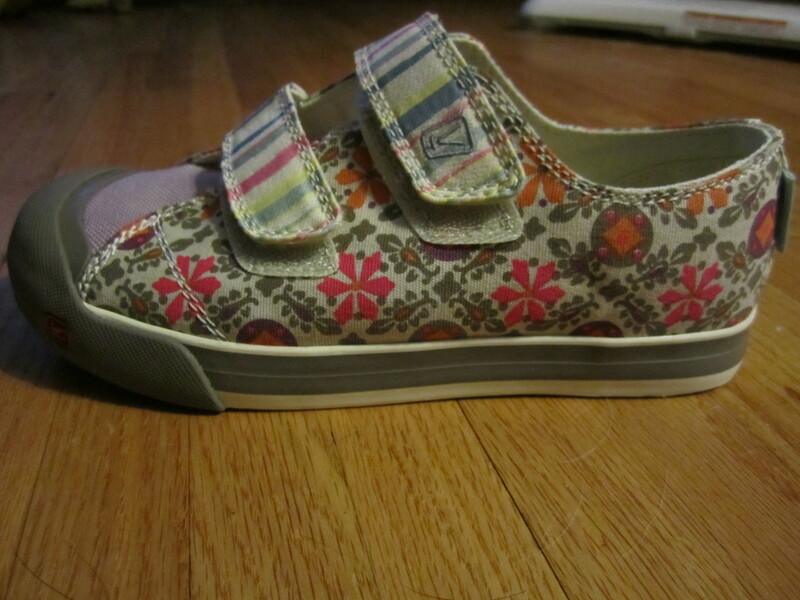 A ladies’ 6 is a girls’ 4, and discovering the children’s sizes often fit has saved me countless dollars. It’s also a nice thing to wear shoes no one else in my age bracket has. The green ones look adorable, Kay! Hope they are massively comfortable too, and work well when you are walking around in Kuwait! Thanks, Cinderella. Test drives around the dollhouse are promising! My tanlines are going to be the thing of legends.